Dam: Jovan Where's The Party? 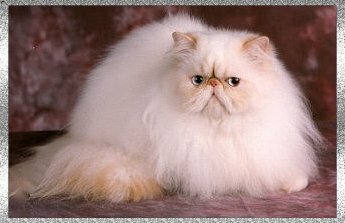 Sire: GC,RW Catbery Tail’s Baggy Pants, Jr.
"Pesto" became a 2 show Grand Champion at the Cleveland Persian Society Show in Parma, Ohio 2010. 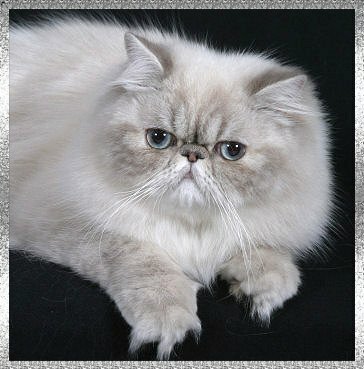 Many thanks goes out to all the judges who final Pesto through out her kitten and adult show career. THANK YOU ALL! "Adonis" granded at Burlington,Vermont show on Jan. 8th & 9th 2011. He ended his kitten career with multiple Best Kitten awards! A special Thank You goes out to all the judges who supported Adonis through his show career and to my family, friends who cheer him on! THANK YOU ALL! "Manny" with his bubbling personality was a true delight to show! He finish his show career granding at Fyfe & Drum show 2007. A big Thank You goes out to Michelle for showing Manny so beautifully! Also, many Thanks to Melinda Murray for this darling boy and to all the judges who supported Manny through his show career! "Thank You All"! "Hailey" is a 3 show grand finishing up her show career at Kimberton, PA show 2005. Many thanks to my family & friends for there support through her show career. A very special "Thank You" to Christine Arnold of Karabel for Hailey's start in the show hall at the tender age of 4 months. Also to all the judges who appreciated her beauty! "Thank You All"! "Reddy" is a very easy going boy and was a delight to show. 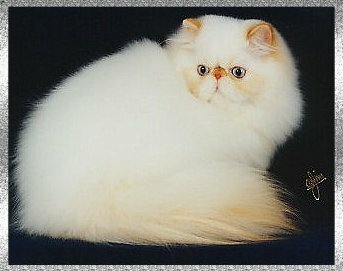 Throughout his kitten career "Reddy" made multiple Best Kitten in show finals. 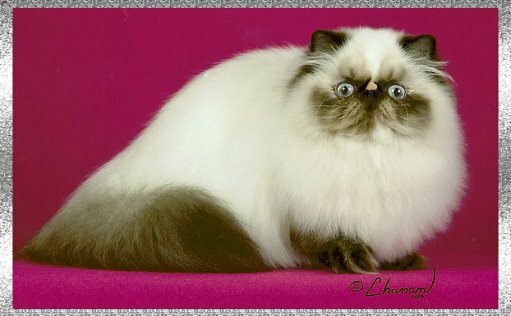 He was awarded highest scoring Himalayan Kitten in show at The Fyfe & Drum show in 2005. He went on to become a 4 show grand ending his show career at York, PA 2005. A BIG "Thank You" goes out to all the judges who made this all possible! "Cassee" became a 4 show Grand at the Timonium, MD show in 8/2005. 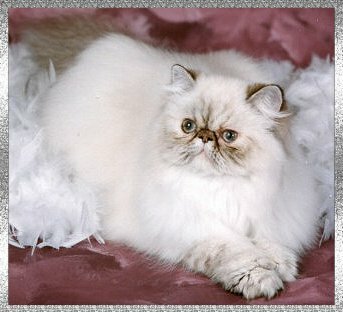 She was granded by my Dear friend Michelle Sostar of Purrs-of-Luv Cattery. A Special "Thank You" goes out to Michelle for her dedication and presentation of Cassee during her show career. Cassee's granding was a wonderful surprise and I owe it all to you! "Thank You" Michelle! Very much to my surprise Max became my first 3 ring, one show grand at Garden State Show, NJ in 2002. It was an unbelievable weekend for me!! Cheri was a 3 show grand, and I owe many thanks to Lydia Trunko of Kalypso for getting her halfway there - Thank You, Lydia! "Sunny" is a Flame Point male, born 8/28/1999. He was my very first show male that I granded. "Sunny" is an overall beautifully well-balanced male. 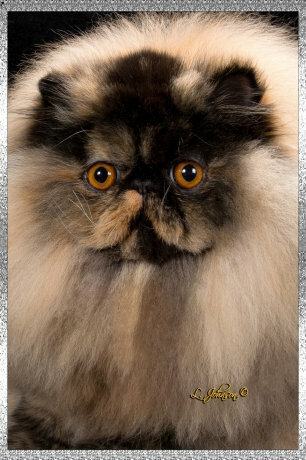 He came to me from Lisa McEntyre of Jaemak cattery, and I am very grateful to her! 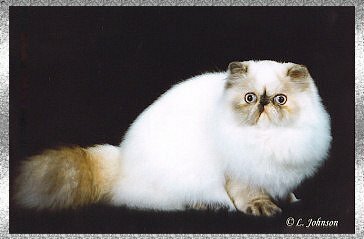 During the 2000-2001 show season, "Sunny" was the North Atlantic Region's 2nd Best flame point and 2nd Best Himalayan, and was also the 12th Best Himalayan Nationally!!! 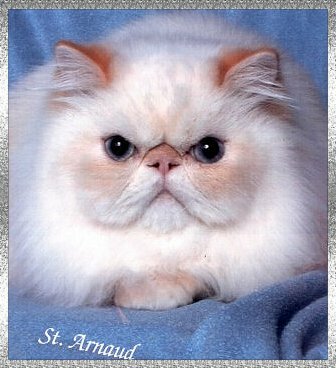 "Sunny" was also earned the award of 11th Best Himalayan for the 2000-2001 show season from the Atlantic Himalayan Club! 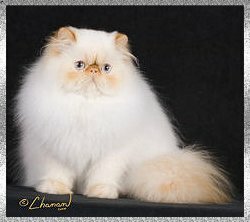 Sunny is now loved by Tammy Lewis of Oak Branch Himalayans. "Sunny" is a Flame Point male, born 1/20/1999. 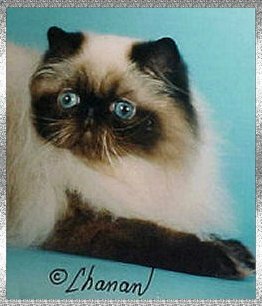 "Sunny" was shown in Premiership during the 1999-2000 show season, and earned the Atlantic Himalayan Club's award of 6th Best Premiership cat nationally. "Sunny" now happily lives with the Lunnick family. "Carmeline" is a Tortie Lynx Point female, born 8/10/1998. She is my first Grand Champion of my own breeding! 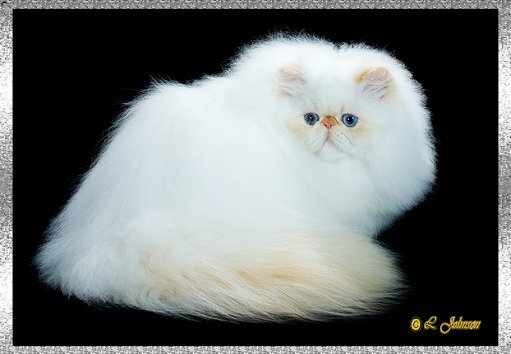 Carmeline was a very flashy cat to show - her point color with a snow-white coat was a big plus for her. She now enjoys being ruler of the house! 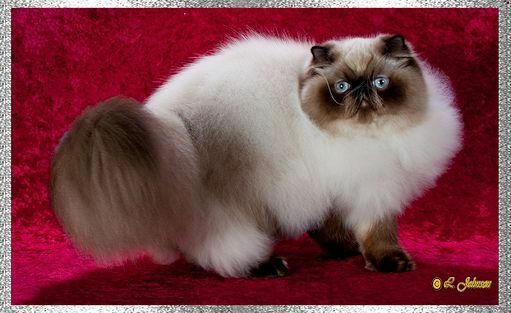 Special thank you to Lori Kerr for Carmeline's mother Catbery Tails Sweet Pea. 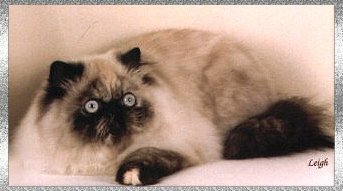 "Angel" is a Blue-Cream Point female, born 8/24/1998. She is a very compact female, with large blue eyes and a very sweet personality. She loved going to the shows! "Callie" is a Tortie Point female, born 8/12/1997. "Callie" is very special to me, for she is my very first Grand Champion. 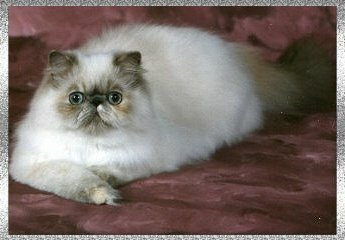 "Callie" earned the title of the Atlantic Himalayan Club's 11th Best kitten for the 1997-98 show season, and the North Atlantic Region's Best Tortie Point, 1998-99 show season. 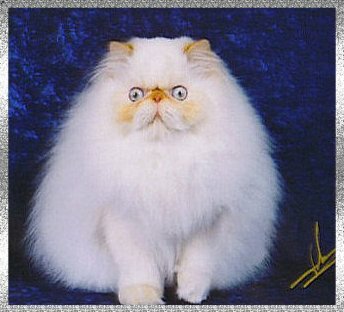 Lydia Snyder Trunko of Kalypso is the breeder of "Callie" and many of my other cats. I owe her many, many thanks for entrusting me with her beautiful cats, and her guidance throughout the years.